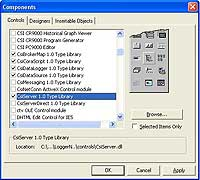 LNServer-SDK/U allows customers with earlier versions of LoggerNet Server-SDK to upgrade to the current version. Learn more about its capabilities on the LoggerNet Server-SDK product page. LoggerNet Server-SDK/U allows customers with earlier versions of LoggerNet Server-SDK to upgrade to the latest version of LoggerNet Server-SDK. Learn more about its capabilities on the LoggerNet Server-SDK product page. Developer should be familiar with Campbell Scientific’s hardware and software. CR10X (retired) Compatible with the mixed array, PakBus, and TD data logger operating systems. CR23X (retired) Compatible with the mixed array, PakBus, and TD data logger operating systems. CR510 (retired) Compatible with the mixed array, PakBus, and TD data logger operating systems. LoggerNet Server-SDK supports any data logger that can be supported by the LoggerNet server.